Mouse pads aren’t the total necessity they once were. On some surfaces, they’re still quite mandatory. On others, they can help manage mouse sensors perform a little better. So when you invest in a high quality mouse with a powerful sensor, it only makes sense to get a mouse pad that can help you get the most out of your equipment. Once you’ve got one picked out, a good mouse pad is something you can use for years. 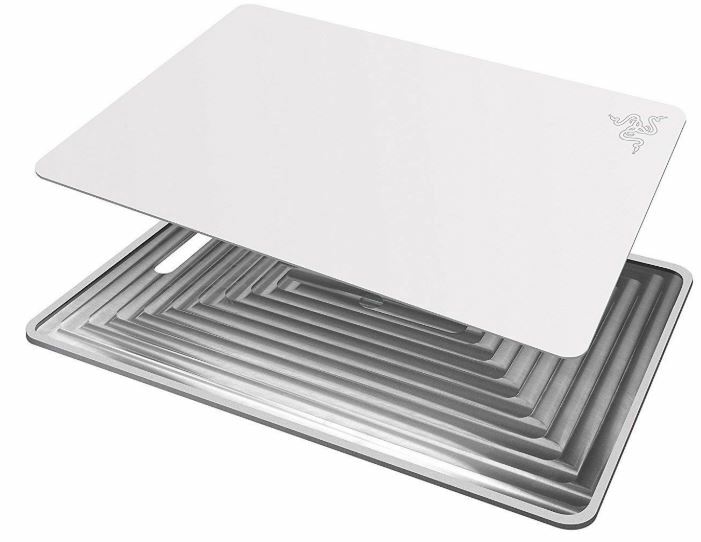 Fortunately, finding a hard-surface plastic and metal mouse pad is not much different from picking a regular mouse pad. If you keep to a few critical concerns, then you can’t go wrong. Some types of surfaces are terrible for mice. Glass is one of the worst. Other surfaces are fantastic. What makes one surface better than another? Much of it has to do with reflectiveness. Which is why metal and plastic mouse pads can be made perfectly for modern mouse sensors. The difference between metal pads and plastic pads isn’t night and day. Most of the difference has to do with the motion of your mouse as you move it across the pad. Plastic pads can be made with slightly more grip, which gives a bit more modular control while moving the pad. Metal pads are almost universally made to be smooth, which is great for an effortless sliding motion. Admittedly, comfort isn’t exactly the point of going with a plastic or metal mouse pad. The point is sensory accuracy, control, smoothness, and general use capabilities. For instance, being able to pick up the pad and use it in another location. Even against a squishy couch cushion. Nevertheless, some pads are a bit smoother than others. Some have nicer edges. Comfort is a factor even when you’re looking at tougher metal pads, it’s just not as front-and-center as when you’re considering a thick foam pad. Some gamers are about style more than others. But style can be worth keeping mind, especially if you have some kind of matching aesthetic in your build. If you’re only using silver colored components, it doesn’t hurt if your mouse pad matches. The importance of this kind of thing is subjective, but it can be used as a great tiebreaker when you’re feeling indecisive. How large do you want the pad to be? In many cases, bigger is better. But some people interested in portability, and others have very finite desk space. Smaller pads tend to be about eight inches in length, while larger pads will run twice that. In the gaming space, a brand like Razer hardly needs an introduction. 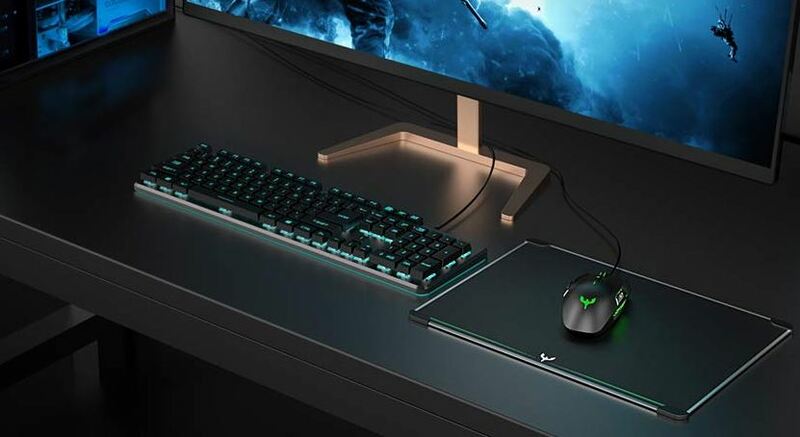 Though some of their products have been accused of being a little gimmicky, lately Razer has been focusing on ensuring their showmanship is matched with utility. You can really see that in this pad. More specifically, the Invicta Mercury Edition Mouse Mat is really two pads in one. Literally. There are actually two separate sides to this mouse pad. 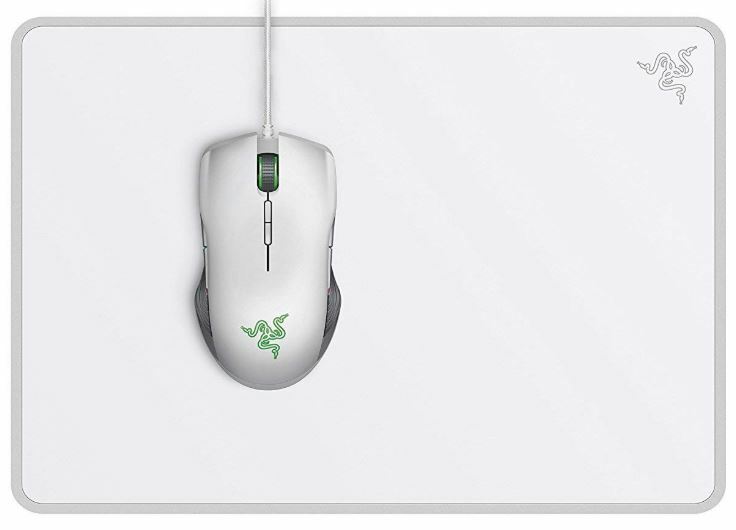 One side is a slick and smooth surface that allows your mouse to glide freely. It’s like throwing your mouse down a sheet of ice, the gliding motion is quite nice. The other side? It uses a rough textured control surface, which provides a bit of resistance, and which makes this pad more suitable for someone who’s trying to move their mouse with great precision. For instance, you might swap over to this side of the mouse pad when you want to start playing first person shooter games. The Invicta pad measures 10.1 x 14 x 0.2 inches, and weighs just over 1.5lbs. It’s actually available in two different types, Mercury and Quartz. But the Quartz is hardly worth a look. It’s highlighted by a somewhat unappealing shade of pink that runs around the entire edge of the mat. By contrast, Mercury feels more sterile and clean, with a silver edge running along the end of its empty surface. The topside is pretty close to pearl white, highlighted mostly by the Razer logo that has been positioned in the corner of the mat. The logo is about two inches across, so it doesn’t take up much space, visually speaking. If you flip over to the other side, you’ll find a slightly grayer mat, which indicates you’re using the second surface. These materials weren’t selected simply for their aesthetic appeal, but because they’re optimal reflective qualities. In other words, to make it as easy as possible for the sensors on your mouse to actually read what’s going on. 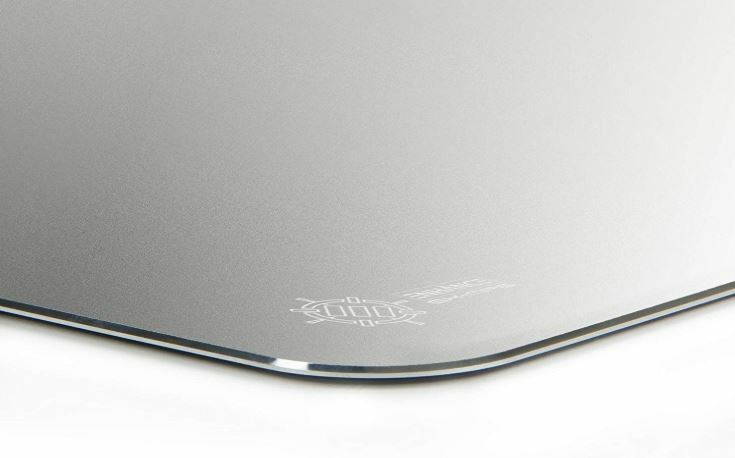 Regardless of which side of the mouse pad you are currently using, both sides are encircled with an aluminum base. The base isn’t just an edge that is built-in with the pad. On the contrary, the base is actually a full piece of aluminum, like a platter on which the plastic surface may rest. It serves to make the otherwise thin pad perfectly rigid. For someone who’s running a desktop PC from the comfort of their couch, it can be handy to have a rigid surface to have around. The same is true for traveling. Having a mouse pad that’s rigid without turning the pad into a piece of concrete? That’s a wonderful design innovation that anyone should be able to appreciate. It’s the best of both worlds. Additionally, having the aluminum there really helps add to the durability of the pad, and makes the interchangeable swapping process really smooth, since the whole pad moves as one piece. 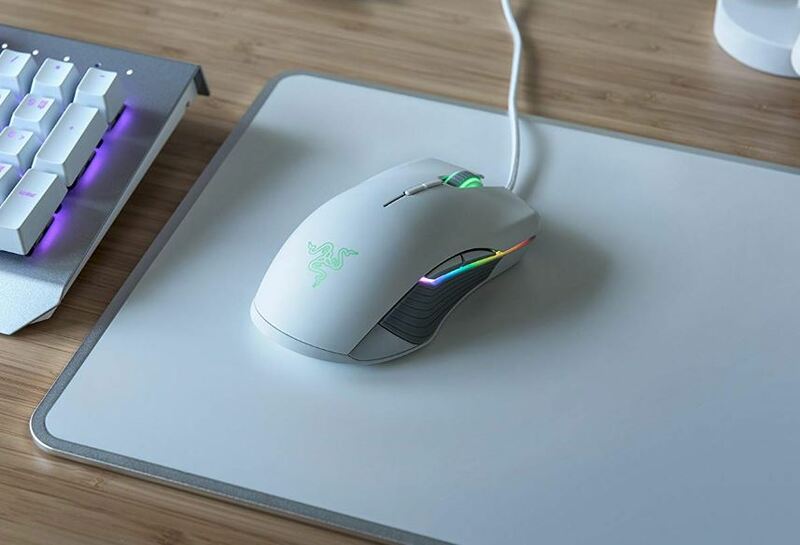 ENHANCE doesn’t have the kind of brand credibility Razer does, but when you’re looking at a purely physical product like a mouse pad, that’s less of an issue. After all, these pads aren’t going to need any special software support. As long as they’re well-constructed, it really doesn’t matter who made them, does it? It’s easy to tell what this pad is by looking at it. The frame is entirely aluminum alloy. Quite perfect for running optical and laser mice. The surface is totally slip free. 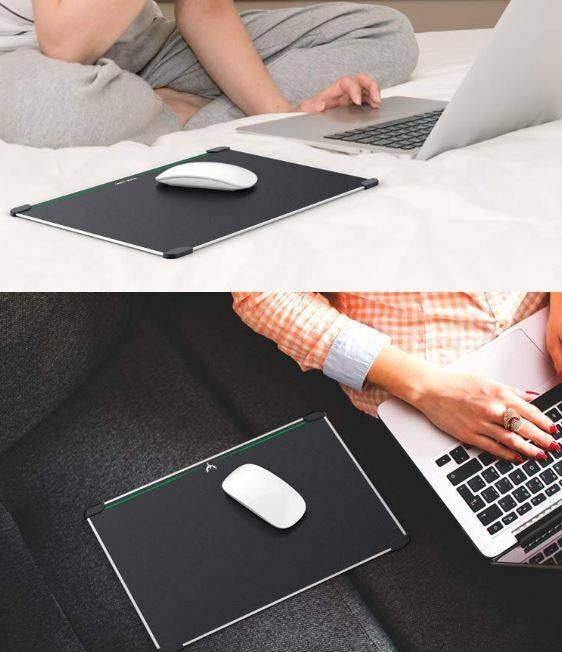 Unfortunately, when you need a bit more grip, you can’t just swap the mouse pad over because the other side is a non-slip surface. Fortunately, that non-slip surface, combined with the weight of the pad, can do wonders for stability. 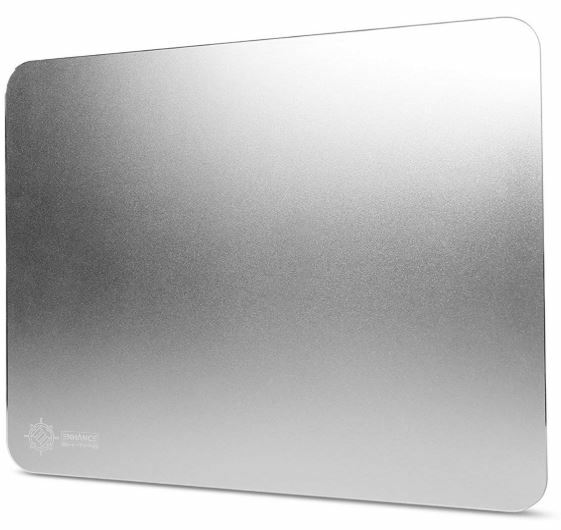 For a traditional hard-surface mouse pad, aluminum is a great way to go. The metal finish remains fresh, while resisting wear and tear over time. In this case, the aluminum pad is cut to measure 12.4 x 10.6 x 0.3-inches. This pad has about 80% more surface area than a standard small mouse pad, which is great for ensuring your hand never comes close to slipping off the edge during play. When it’s sitting on a desk, the rounded edges give a sense of depth, even though the pad remains terribly slim. 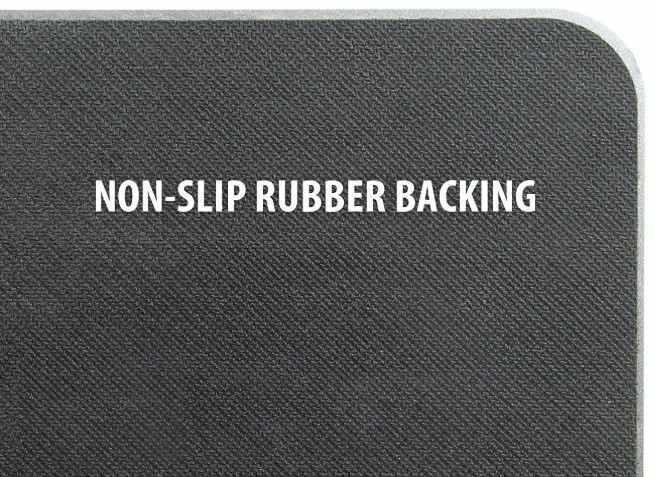 The backside so covered with a non-slip rubber, ensuring the pad isn’t allowed to slide around while in use. 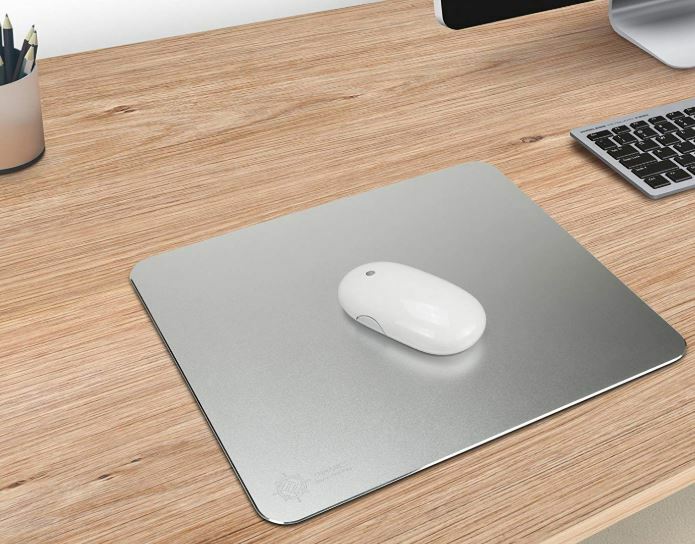 Because of the metallic build, this mouse pad comes close to weighing 1.6lbs. Pretty heavy for a mouse pad, but really that just adds to its sense of stability on your desk. There’s no making this thing budge, it’s much stiffer than a regular pad in that regard. Aesthetically speaking, the ENHANCE Aluminum Metal Gaming Mouse Pad is available in mercury and black. However, the mercury really looks more like silver. There are upsides and downsides to working with aluminum. When it comes to downsides, this mouse pad is terrifically cold. If your home office is 50-degrees in the morning, you’ll have a hard time putting your arm in this pad without getting frost burn. But provided you don’t work from inside of a cooler, this is really less of an issue. Conversely, once you’ve got the pad warmed up with your own body heat, it has a pleasant warmth that’s generally lacking from simple plastic and cloth pads. 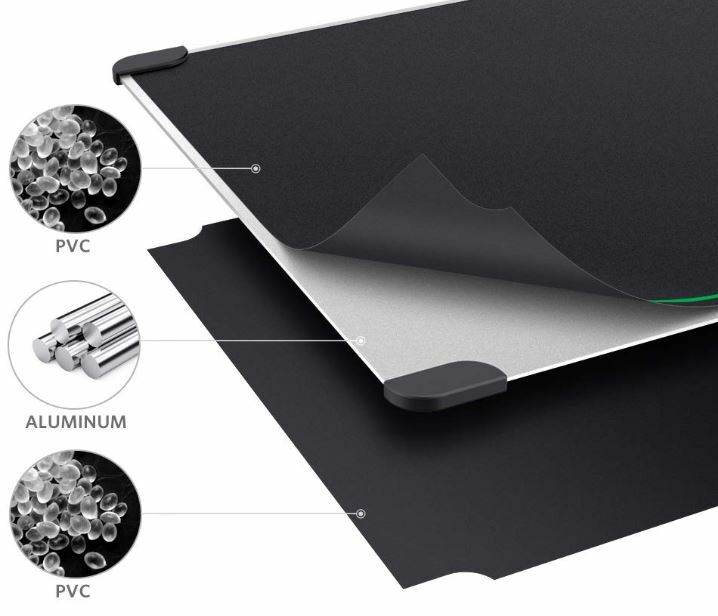 ENHANCE includes a three-year warranty with their metal mouse pad. Though it’s hard to imagine you’ll need a warranty on this product to last longer than 90 days. After all, how much can go wrong with a slab of aluminum? The beauty of a plastic pad is it won’t freeze your arm. It’s also wonderfully simple to wipe down, and cost effective compared to tougher materials. The Blade Hawks Gaming Mouse Pad doesn’t have the aesthetic glory of the ENHANCE pad’s all metal finish, or Razer’s bright glowing pad. But having a multi-layer design, this pad is actually more complex than it initially lets on. Aesthetically, the Blade Hawks Gaming Mouse Pad is a bit of a no-nonsense kit. Practically speaking, the surface has been given just enough grit for your mouse to be able to get some reasonable traction against it. Underneath the surface, there’s a nice firm piece of aluminum to keep the pad running in place. 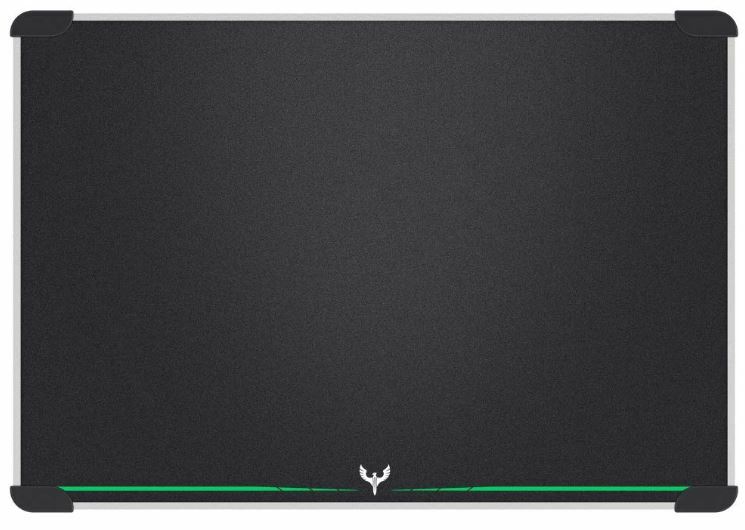 The Blade Hawks Gaming Mouse Pad is available in three sizes: small, medium, and large. The larger pads measure 13.4 x 9.4-inches, and is only 2mm thin. That makes it hardly any larger than a few sheets of paper. The surface provides some friction compared to a smooth sheet of plastic, this is still a fairly low friction pad. Because it’s intent on providing higher degrees of control for your mouse cursor. Atop the metal, you’ll find a firm PVC surface that’s great for resisting wear and tear, withstanding water, and generally lasting through long play sessions. It’s also great at resisting dust, and because it’s not polished, it’s not a fingerprint magnet. Similar to the ENHANCE pad, this pad is pretty hefty, weighing 1.4lbs. Along with a little help from rubberized parts, that’s great for stability. The corners are rubberized rather than the entire bottom surface, which actually does make it possible to use either surface as needed. But unlike the Razer pad, there’s isn’t a second type of surface you can use on the other side. Blade Hawks includes a one-year warranty on their pads. That’s not quite as long as the warranties available through other brands, but for mouse pads like this, one year is basically as good as ten years. The Blade Hawks Gaming Mouse Pad is a hybrid of metal and plastic. The inside of the frame is a chunk of aluminum, while the outside is anti-skid surfacing and a professionally finished metallic siding. The PVC surface provides a perfect amount of grip for FPS players, or really anyone interested in pixel-perfect mouse control. The only downside to this pad is it’s really not portable because you can’t roll it up or otherwise disassemble the layers. Otherwise, it’s a solid hybrid pad for someone on a budget. It’s easy to see why someone might fall in love with the all-metal appearance ENHANCE’s pad. Its utilitarian and minimalist style has many fans. You do have to accept this pad has no real grit, so your mouse will always flow smoothly across it. That’s not right for everyone, but it’s great for people who don’t have any special surface requirements for their mice. 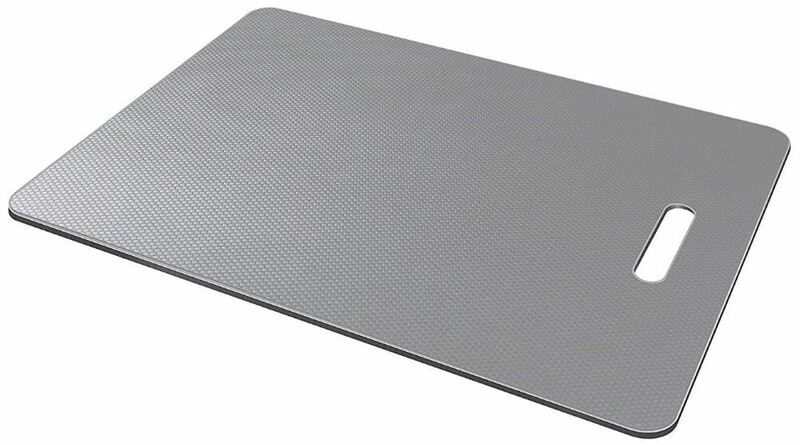 If you can forgive the fact it this pad can get chilly between uses, then it’s definitely worth picking up the ENHANCE Aluminum Metal Gaming Mouse Pad. The Razer Invicta Mercury Edition Mouse Mat is basically two mats in one. Unfortunately, it has the price of three mats in one. It’s certainly not the right choice for someone who’s trying to find something cheap and simple. But aesthetically, these pads are certainly gorgeous. And being able to switch between the two different surfaces provides a fantastic measure of control. For someone who wants more than a basic pad, the Invicta Mercury is worth careful consideration. i got the GX-MP5 for the CS reference and the reintroduction to the MP5 to CS. I’ve since spilt my ber on my mouse pad and the graphic is bubbling up. So now im back using my old pad and regretting accepting the suggestion of a website ive never heard of.